The Accidental Millionaire How to Succeed in Life Without Really Trying A Memoir | Free eBooks Download - EBOOKEE! An entrepreneur's rags-to-riches story reveals that sometimes not knowing where you're going is the best way to get there . . .
A first-generation Chinese-American, Gary Fong was raised in one of Los Angeles' least-desirable neighborhoods and was forced to deal-in his own quirky and often very funny way-with the burdens of poverty, crime, and his parents' relentless aspirations. Spotting a bumper sticker one day that read "Since I gave up hope, I feel much better," Gary promptly did just that. As a would-be slacker (who really, really didn't want to become a doctor), he somehow wound up revolutionizing wedding photography and inventing popular new equipment for photographers. 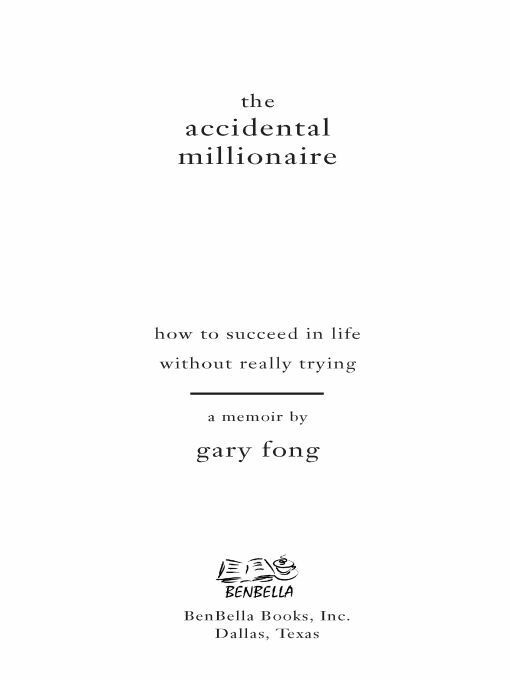 At turns hilarious, insightful, and instructive, The Accidental Millionaire is a memoir that turns the traditional self-help principles upside down, rejecting the goal-oriented approaches and showing us how Gary Fong stopped trying-and started succeeding. No comments for "The Accidental Millionaire How to Succeed in Life Without Really Trying A Memoir".